Even after thousands of years sharing our homes, cats still remain mysterious. For one thing, they spend an inordinate amount of time grooming themselves, up to half of their waking hours. But all of that primping isn’t about vanity. 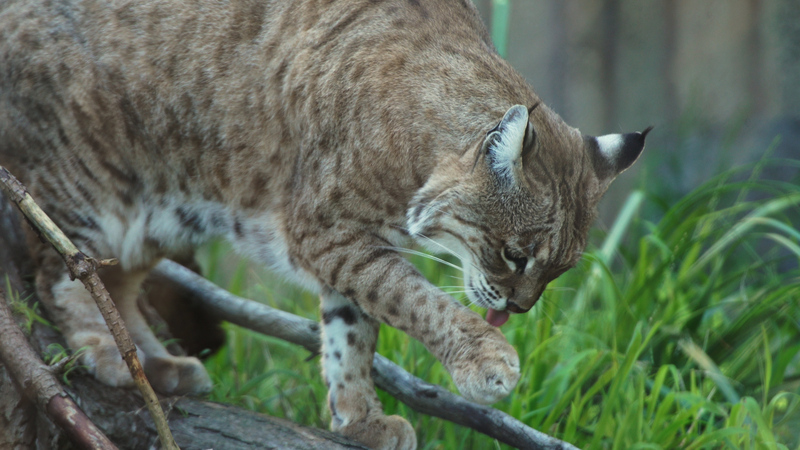 For ambush predators like cats, staying clean is a matter of life and death. In this episode of Deep Look we get up close and personal with these fastidious felines. By looking closely at cat tongues, research at MIT and Georgia Tech reveals clues to cats’ predatory prowess and finds inspiration for new technologies. Ever wondered why a cat’s tongue feels like sandpaper? Take a close look. Cats’ tongues are covered in little spines. 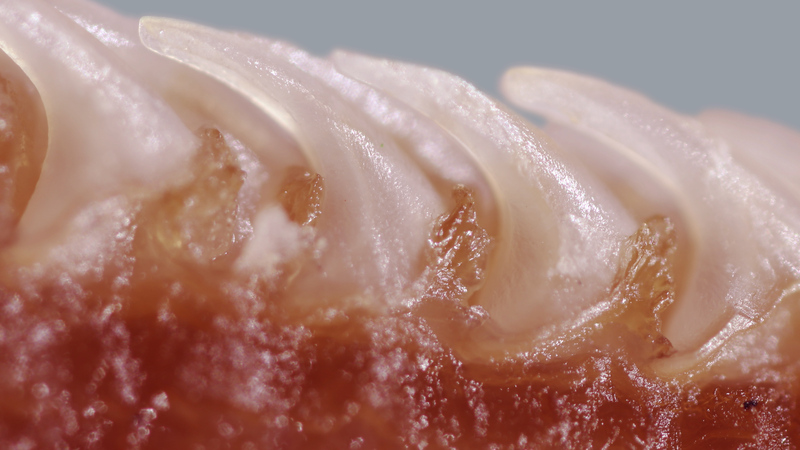 Called “papillae,” they look like tiny hooks. “They’re made of keratin, just like human fingernails, said Alexis Noel, a researcher at Georgia Tech. 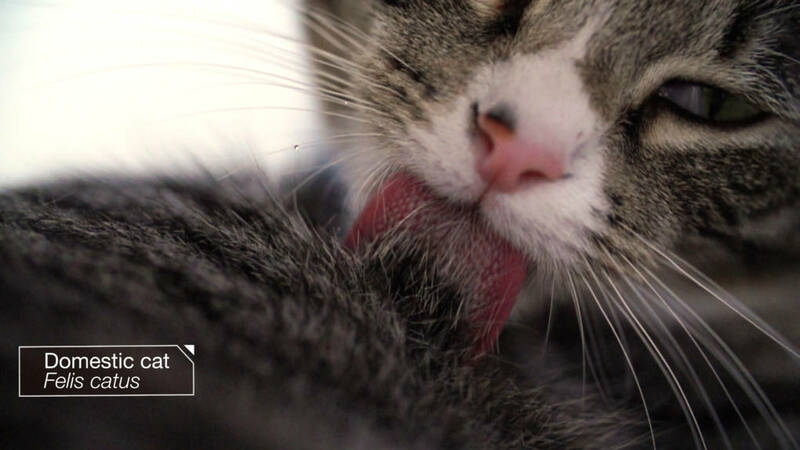 While home for the holidays one year, Noel noticed her family’s cat, Murphy, accidentally getting his tongue caught on a blanket while grooming himself. Murphy was able to easily free himself from the temporary tongue trap by pushing his tongue back against the blanket, but not before Noel noticed the tiny spines caught in the blanket’s weave. As a doctoral candidate in mechanical engineering with an interest in natural models, Noel is fascinated by the efficiency of cats’ tongues in keeping them clean. Inspired by that that observation, Noel decided to study cat tongues by creating a model that replicates the tiny spines. 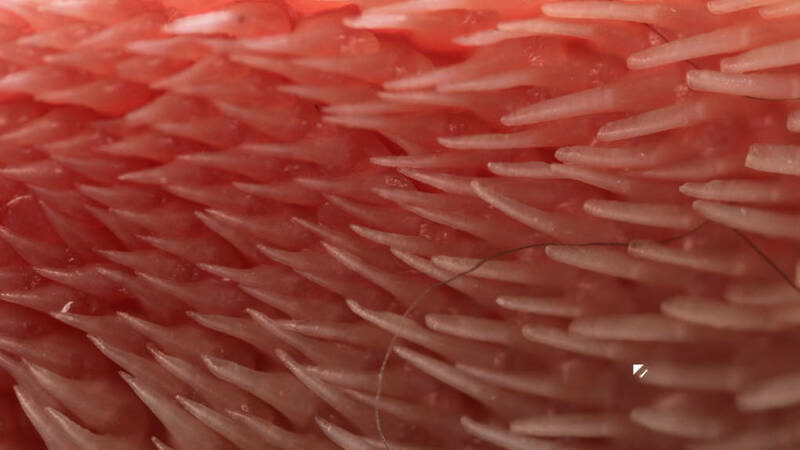 She scanned a specimen of a cat tongue and 3D printed out the structure at 400 percent scale. She sent the artificial cat’s tongue through it’s paces inside an a machine that drags the model across a patch of fake fur. To clean a traditional hair brush, you need to pluck the hairs out from between the bristles. Noel’s cat tongue model was much easier to clean: She simply ran her finger across the surface in the same direction as the spines. Noel thinks this technology may one day lead to better grooming or cleaning tools for people and pets, and might even be used to create soft robots that can more gently interact with humans. Cats groom for several reasons. In addition to detangling their fur, it removes parasites and their eggs. It also redistributes oils produced by the cat’s skin that provide the fur with some waterproofing. It’s also another way to show trust between cats. Friendly cats tend to groom each other. And if a cat trusts you it will groom its human. But perhaps the most important reasons to stay clean is that as ambush predators, cats need to hide their smell from prey. Prey species tend to be on the lookout for danger, and one whiff of the wrong odor can give the cat away. 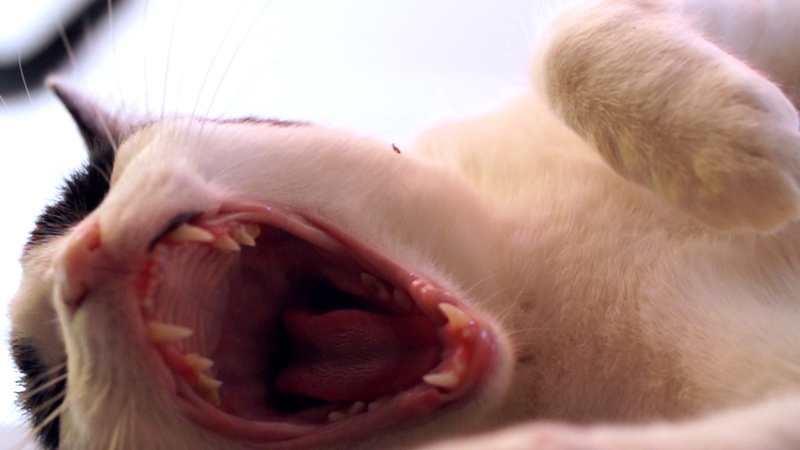 Like most other mammals that are predators, cats have wide mouths to help them sink their teeth deep into their prey. The large opening on the sides of their mouth helps them get a better bite. While working at MIT, Jung collaborated with Roman Stocker, Pedro Reis and Jeffrey Aristoff to study how any why cats use a lapping technique to drink. The team of researchers studied high-speed video of cats to show how they flick the surface of water with the topside of the tip of their tongues. The cat bites the column at just the right moment to get as much water as possible while also keeping its face dry. The MIT team created a model that mimics the way cats create the column. Researchers used a glass disc that rests directly on the water’s surface. They adjusted the acceleration of the disc up from the surface to find the optimal rate. Too fast and the disc doesn’t get a chance to draw as much water up into the column. Too slow and gravity has a chance to pull the water back to the surface. They discovered that house cats tend to lap water about four times a second while larger species of cats, like lions and tigers, lap slower as their body mass increases. The larger species also capture a greater amount of water per lap compared to the smaller species. 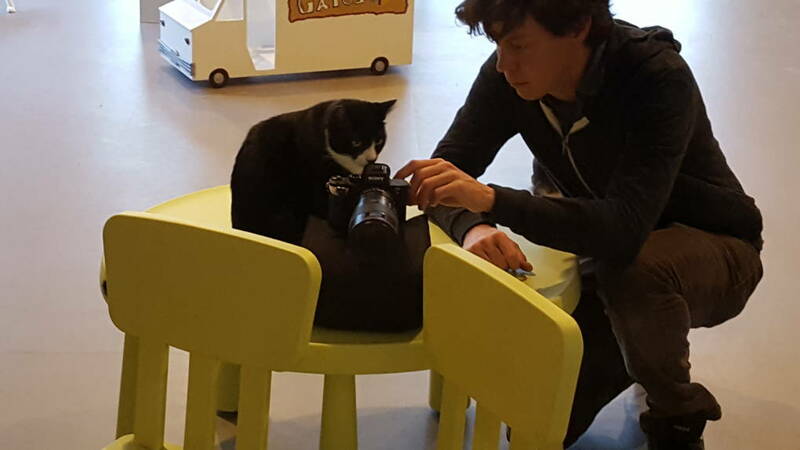 This episode of Deep Look was largely filmed at Cat Town Cafe, a rescue and adoption center in Oakland. Special thanks to Mikel Delgado of Feline Minds, a cat behavior consultant.